It's good for me to take a minute and reflect on my day. 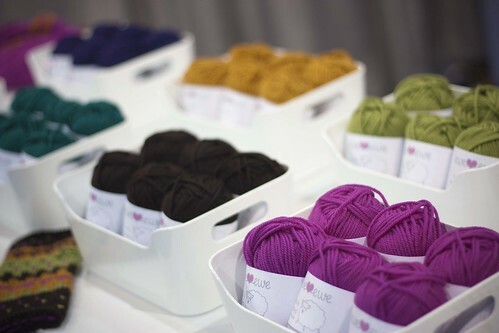 Since I have a freelance business and a yarn company my days are usually one big to-do list that spills into the next day and the next day and the next day. This keeps happening until the weekend when I sit around thinking about the list of things that needs to be done. It's not a good cycle and one that I'm trying very hard to break. A good way for me to do that is to stop for a minute and reflect on what I actually HAVE accomplished in a day instead of what still needs to be done. So here's a look at my day today how I like to think of it. 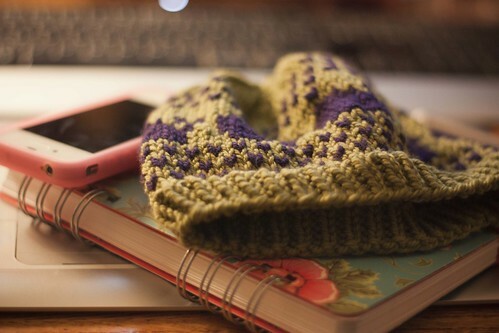 There's my keyboard in the background, my pen tablet for design, my planner, the knitting pattern I designed, wrote and photographed and last by not least, my iPhone which is never more than 3 feet away. I crossed 10 things off my list today! I think what I need to come to terms with is that my list will never get smaller so I just need to embrace the chaos and learn to love it. It's a GOOD thing that the list doesn't get smaller because that means I get to keep working! I started a yarn company! I have trouble believing I can say that but I can say it because I've done it. I have a product with a label and a website and even better, I have orders for that product! I picked the colors and developed the yarn. I have a stock of sheet knitting patterns and also some free knitting patterns. There's tons of ideas swirling around in this brain of mine and I can't wait to get it all out there and on paper or pixels. 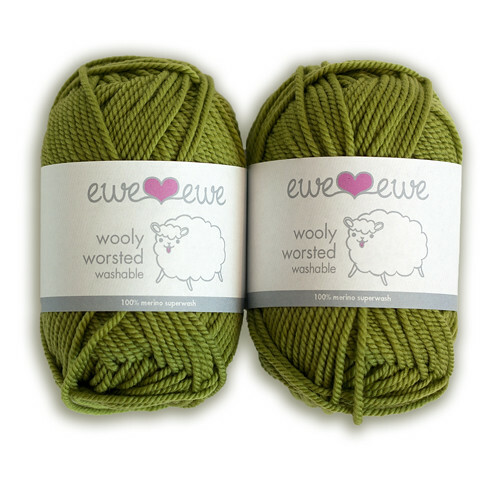 Ewe Ewe Yarns is my new venture/adventure and I'm excited about it like nothing else I've done before. 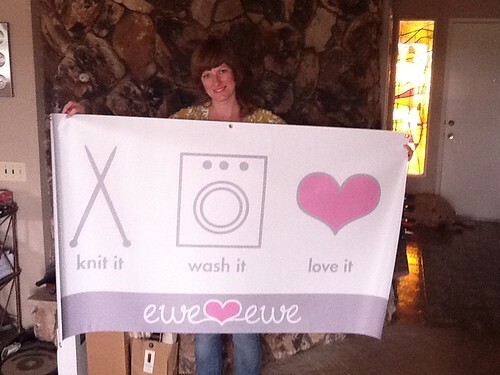 So, please take a minute and check out my new fun over at www.eweewe.com. I want to be happy and show you pretty pictures of my yarn adventures, but I can't. I'm sad. 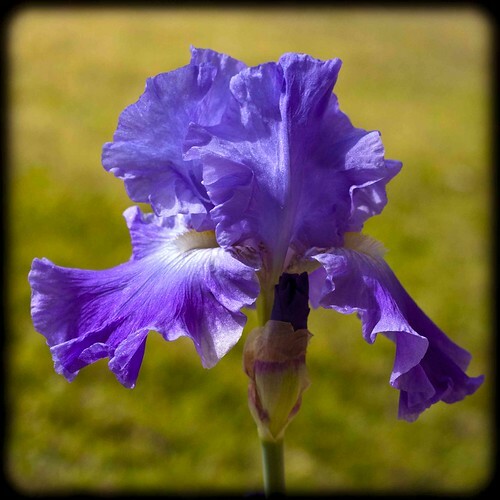 In the last day we've learned that our good friend died suddenly, another friend fell with a stroke and is in the hospital, and a family relative lost her battle with brain cancer. None were old. All are making me slow and contemplative. Stop, breathe, relax and enjoy. Be happy you can. I know, I lost you already. I do a lot of work for a computer hardware company and sometimes I have no idea what anyone is talking about. But I feel like I should kind of pretend like maybe I might understand a small iota of a sentence while I'm there. So while in a circle of middle-aged male engineers I smile, nod, and take lots and lots of notes. Then I rush back to my desk and read over my scribbles trying to decipher half of what I wrote down. I was recently art directing some new collateral materials and I had to compare one company's processing speed to another company's processing speed. Of course nobody wants to compare apples to apples so I had the task of formulating a chart. A chart about flops, or rather FLOPS because it's an acronym, you know. Oh, you don't know? 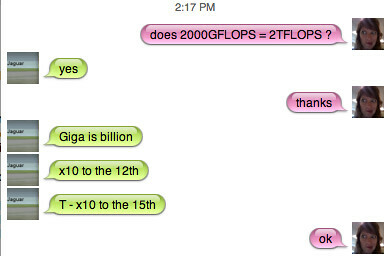 FLOPS or FLoating point Operations Per Second is how many times a little processor chip is computing data. I learned that yesterday. I imagine it like a fish out of water flailing about on a boat deck but it might be a bit more structured than that. Anyway, I'm happily making my chart when I realize one company is talking about their product in gigaFLOPS and the other is in teraFLOPS. What's a girl to do? I'm certainly not going to go back over to the gaggle of guys and let on that I didn't comprehend a single word they said. So I find my own engineer. The engineer at home who knows more about computer hardware, computer software, computer programming, computer anything than anyone else, ever. He gives me a bit more information than necessary, which I love by the way. Because I do firmly believe that a designer should learn as much about their client's products as possible to give them the ability to do the best work possible. But the extra information he delivered wasn't correct and I just couldn't pass up the opportunity for a little jab. But then I got leveled. I can feel the sarcasm dripping out of that last bubble. It should read more like "riiiiiiiiiiiight." I'm thrilled to say Happy Anniversary to my husband. 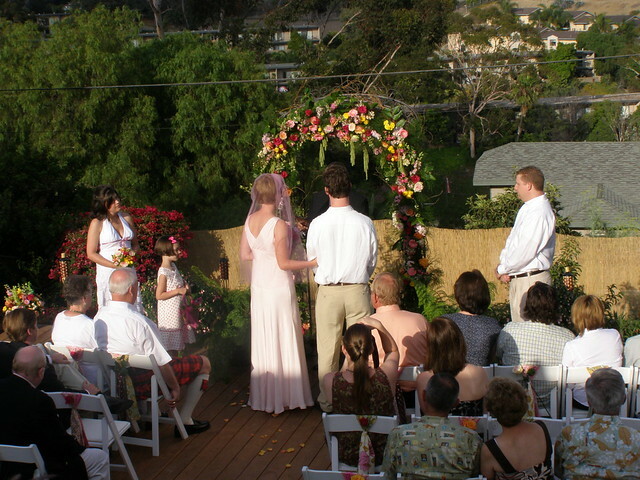 Thomas and I got married at our home in a fun backyard wedding which meant most of our wedding planning revolved around hard labor in our yard. 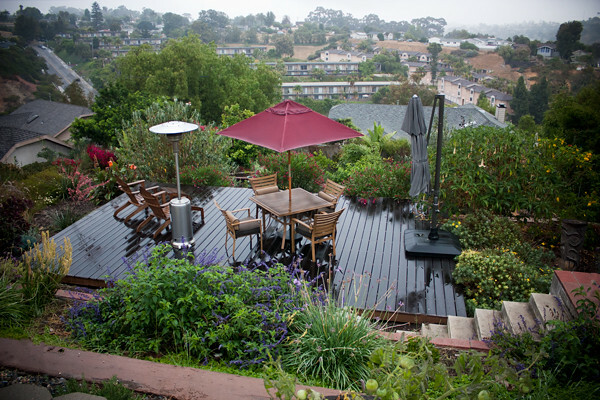 The yard was a barren pit of foxtails and sun-baked clay, and with the help of some family members we managed to build a retaining wall, a deck, new stairs and put in a small army of plants. (Who needs a wedding workout plan when you're hefting 75 pound landscaping bricks and 16 foot lengths of timber?) All that work meant we had a beautiful, lively wedding party outside. And it was perfect. The day was perfect, 07/07/07. The food was perfect. The temperature was perfect, which we knew it would be. July in San Diego is always perfect, always 72 and sunny. But Thomas' very English granny was convinced it would rain. We tried for weeks to tell her that it wouldn't rain on our wedding day. "Granny," we'd say, "it stops raining in April and it won't rain again until November." To which Granny would say, "But where will you put all your guests if it rains?" "It just doesn't rain here this time of year, Granny!" So Granny, today I'm here to tell you that my perfect wedding venue is blanketed in a very cool, very English rain on our third wedding anniversary.